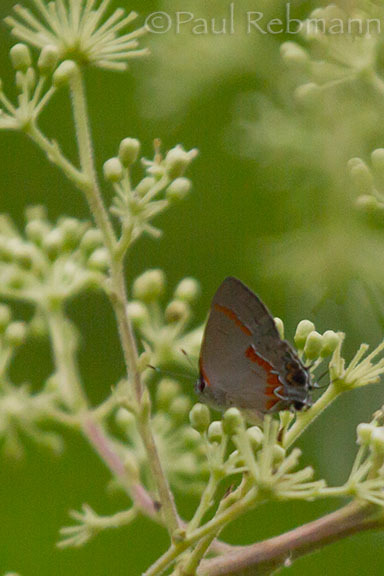 This small butterfly can be found in hammocks and shrubby disturbed sites year-round in much of Florida. The range extends throughout the southeastern United States west into Texas, Oklahoma and Kansas, north through the Ohio River valley and northeast into Massachusetts. 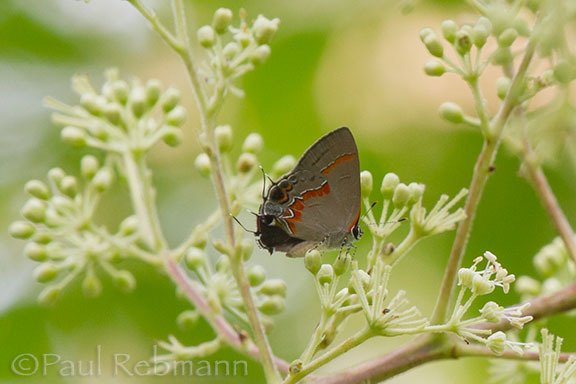 The uppersides of males are a sooty black, females paler with blue on the upper side of the hindwings. Both sexes are grayish underneath with a white post-median line edged with a thicker red-orange band. Each hindwing has two tails and eyespots on the inner trailing edge. Underside markings are a bit bolder on the females. Caterpillar hosts are fallen leaves, mainly of oaks, wax myrtle and sumacs. Calycopis cecrops is a member of the Lycaenidae - Gossamer-winged Butterflies family.